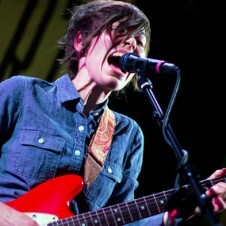 Heather McEntire has been a well-known facet in the punk community as the front woman of Bellafea, but it’s only in the last few years she’s entered into a new genre with her Southern rock group Mount Moriah. The band’s new album “Miracle Temple” is out now on Merge Records and it contains Heather’s most personal songs yet, coinciding with her coming out publicly as the themes are largely about being queer in the South and within the limits of her Southern Baptist roots. Posted February 28th, 2013 & filed under Entertainment.